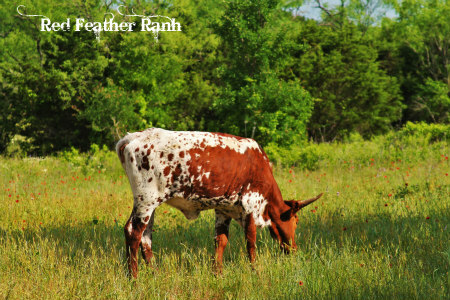 Most farms have a few oddities, things that stand out as just not quite like everything else. Last fall Other Half added a couple of Longhorn calves just because he likes seeing them. They definitely stand out as odd in a pasture of beef cattle, but I see his point. I like watching them too. And the red one is very photogenic. 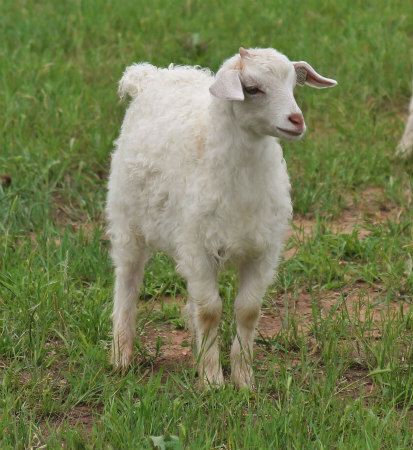 Natty came to us as a foundling who needed a home with other goats. She was like an unplanned pregnancy. We didn't expect her, but now we can't imagine life without this little ray of sunshine. On the other hand, Liam is not a warm and fuzzy ray of sunshine. Liam is more like a loud blast of happy music that jars you out of your comfort zone but leaves you laughing and tapping your foot as you begin to dance to this slightly different little drummer. Yes, he really is as soft as he looks. From the first moment I touched Pygora fiber in a yarn store, I wanted to add a Pygora goat to my fiber flock. Liam is that goat. 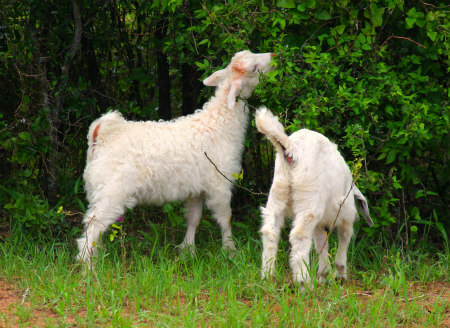 A Pygora goat is, in essence, a cross containing a specific percentage of both Angora and Pygmy goats. It is its own breed now. I've had a lot of goats, but Liam is definitely marching to a different drummer. 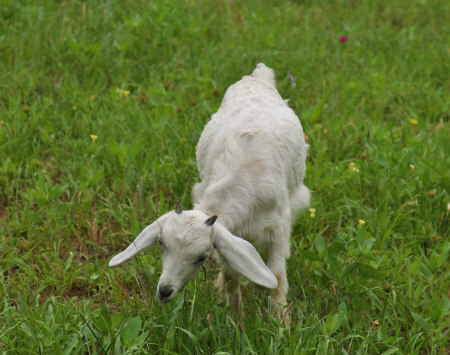 He combines the clownlike personality of a Pygmy goat with the charming annoyance of a bottle baby imprinted on humans. 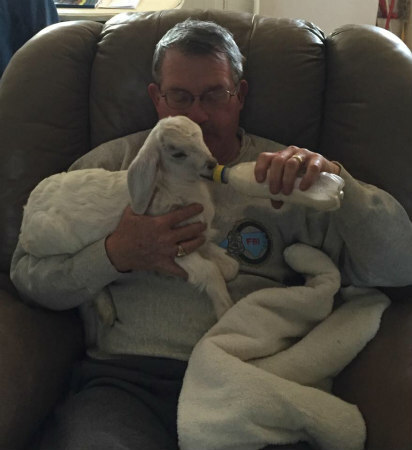 Natty was a bottle baby, but she wasn't imprinted on humans. Natty knows she's a goat. Liam doesn't. Liam is not a goat. Liam is a Liam. He's loud. He's demanding. He's naughty. And yet he's the most adorable little rascal to ever attempt a dictatorship. Liam destroyed the screen door into the kitchen. He has bonded with Other Half and so the moment Liam hears his voice, he races to the screen door and starts to scream and bang on the door. The screen has since been replaced with hardware cloth and we make a point of ignoring him when he bangs at the door. Ignore him? No worries. Liam has no lack of self-esteem and has a very high opinion of himself. He can entertain himself. You may not like how he does it though. Liam climbs on the mule, and pees in the seat. 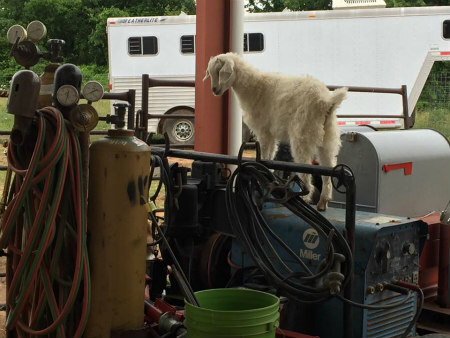 He climbs on the welding machine. He climbs on the tool table. If you leave the tailgate down, he will be in the bed of the pickup truck, and from there, it's just a skip and a hop to the top of the truck. Yes, I've found little hoofprints in the dust up there. Liam gets into trouble the other goats never considered. He climbs things for the challenge of reaching new heights. He flings himself with wild abandon in his quest to reach new heights. One morning I watched him repeatedly run up the front of the mule, across the hood, and up the windshield before falling back to the ground. Over and over and over again. He was like a teenager at a skateboard park. And like the mother of a teenaged boy, I am constantly worried about him ending up in the ER. Liam gave us quite a scare one night when he appeared to have knocked himself out from leaping into the corral bars. We didn't see him do it, I just found him lying in his pen. He was groggy and very un-Liam-like. We whisked him into the house for observation while I considered whether or not I should take him to the ER. Fortunately he was just dazed and given a little time he was back to being Evel Knievel again. Natty is his constant companion. They fit together like Peanut Butter & Jelly. As if from the Island of Misfit Toys, these two have found each other and are best friends. 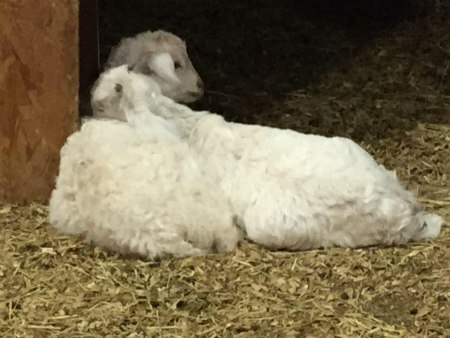 Natty is no longer exhiled while the other babies snuggle in one giant Nubian pile. Now she and Liam form their own snuggle pile. 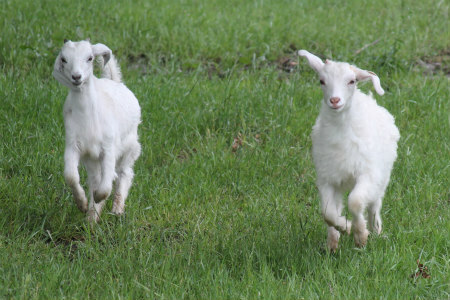 Natty is Liam's liason to the other goats. The Nubians don't really understand Liam. Natty may not understand his special brand of genius either, but she likes him and makes a point of keeping up with him. They are George and Gracie. (If you're under 50, Google it.) Natty is the Leonard to Liam's Sheldon. (If you're over 50, Google it.) Whatever else they are, Liam and Natty are family. HaHaHa!!! 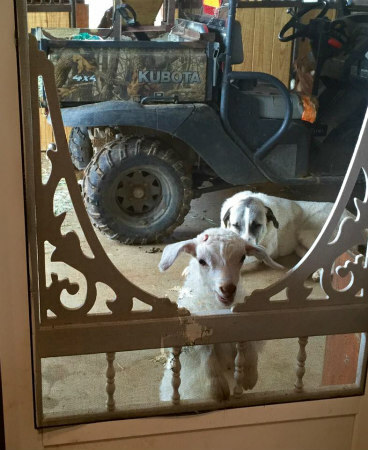 You described my little goats' behavior perfectly! They see everything as Mt. Everest. Why climb it? Because it's there. Sounds like it is never a dull moment. What a story and bless you for taking them in. I think they have it the jackpot!! So Patty has become Natty? 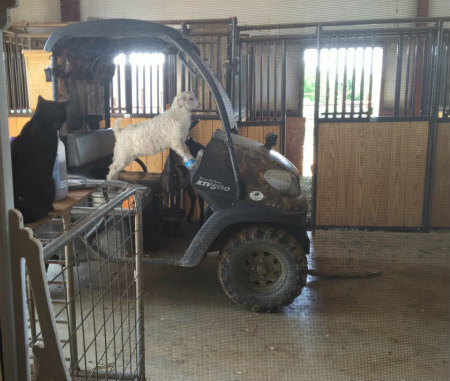 Love the photo of the cat watching Liam in the mule and chuckling.